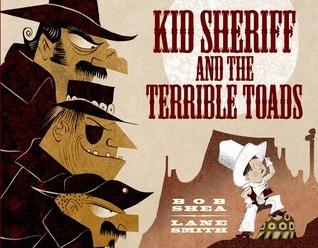 About the Book: The Terrible Toads are causing havoc all over Drywater Gulch. They are in need of a hero to solve their toad problem. Enter Sheriff Ryan, riding into town on his turtle. 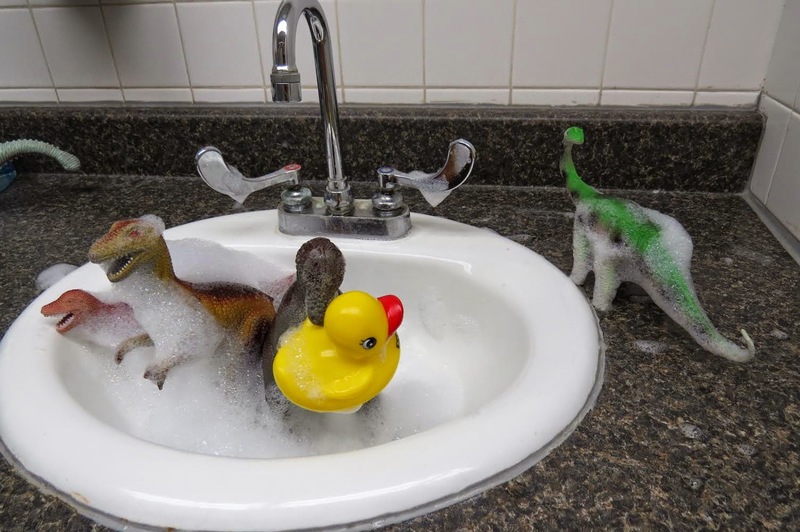 He might not know a lot about robbery and roping, but he sure knows a lot about dinosaurs. And that has to come in handy when catching criminals. 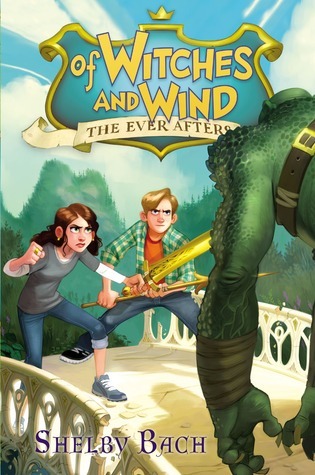 GreenBeanTeenQueen Says: This is a perfect picture book pairing bringing together a hilarious duo. Lane Smith captures the Western-style wonderfully with brown and beige hues makes the reader feel as though they've landed in Drywater Gulch. 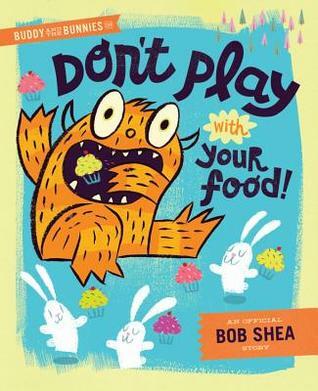 Bob Shea's text is written to be read aloud. This book just begs to be read aloud with various accents and voices. The reader will laugh along as the oblivious (or is he really?) Sheriff Ryan makes many observations about dinosaurs along the way. The humor comes from the Toads wanting the credit for their crimes and Sheriff Ryan and the Toads each outdoing each other with what really caused each incident. Is Sheriff Ryan a smart sheriff who knew who to catch the criminals all along? Or does he just love dinosaurs? The book has such a hilarious twist that readers will be laughing and talking about it long after the book is finished. This is the perfect read aloud for school visits! About the Book: A shy boy who stutters find comfort in talking to animals. 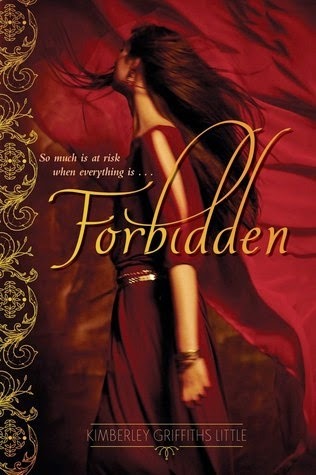 GreenBeanTeenQueen Says: Oh how I have my fingers crossed for a Schneider Award win for this book! (If you don't know about the Schneider Award, it is given to a book that "embodies an artistic expression of the disability experience." I believe that A Boy and A Jaguar does that perfectly. It's a powerful story told in a simple way. Alan Rabinowitz describes how he always had trouble speaking, that no one knew what to do about his stuttering and how he felt most at home when he was with animals. He talked to animals at the zoo and he practiced speaking to his pets at home. His love of animals combines with his desire to give animals a voice. As he studies jaguars and remembers the jaguar he saw and spoke to at the zoo, he becomes a powerful advocate for saving the jaguar. 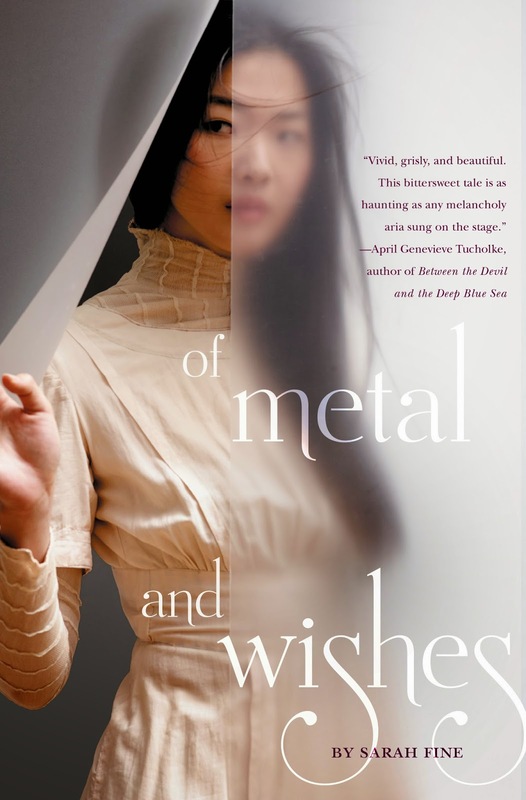 What I love most about this book is that it isn't a story about growing up and getting over a disability. It's a story of living with a disability and not letting it stop you from your dreams. About the Book: The fascinating story of entertainer Josephine Baker. GreenBeanTeenQueen Says: I was vaguely aware of Josephine Baker before reading this book, but only as someone who was a performer. I learned so much from this book and I was dazzled by the text and the art. It is the perfect tribute to such an eccentric and fabulous star. The text is told in a verse, poetic format that makes you feel the jazz and rhythm of Josephine. The illustrations match this perfectly adding the perfect amount of spark and energy. The illustrations jump off the page and dance before the readers eyes. It's a dazzling picture book biography that is absolutely stunning. 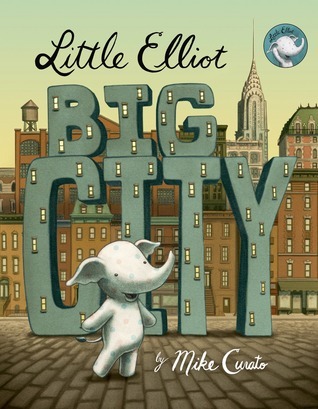 I would have put this on my library's Mock Caldecott list if I didn't think the length would deter some of the younger readers (it's a longer picture book biography, coming in at just over 100 pages). But maybe Josephine will surprise us all with an award win this Winter! 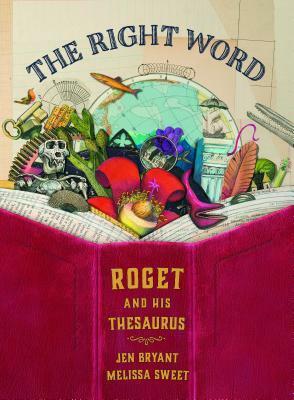 About the Book: The story of Peter Roget, who created Roget's Thesaurus, the most widely used and continuously published thesaurus. GreenBeanTeenQueen Says: I feel like the theme of picture book biographies is sometimes "here's a quirky person and some facts that make them stand out and show that quirky is special." That's not a bad thing at all, but it sometimes gives picture book biographies a feel of simplicity and sameness (which I am sure Roget could have thought of better words!) And while that might be part of the message of The Right Word (Roget prefers to be alone, is shy, and loves to make lists of words), it feels different. The combination of text and illustrations blend together perfectly. Melissa Sweet uses letters, book pages, and a scrapbook style to create a visually stunning biography. Jen Bryant's text give insight into Roget's life without sounding too easy or simplistic. 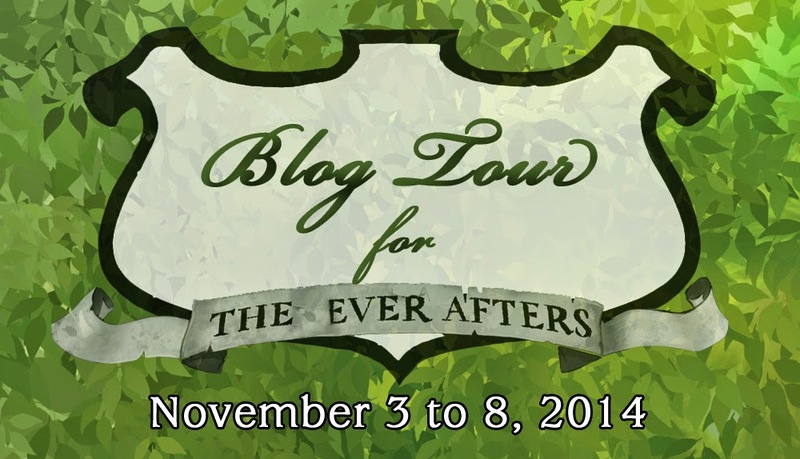 It's the perfect balance of fact and heart and brings readers into Roget's life. The Right Word was a book I finished and immediatly wanted to give to someone else to pour over, read, and enjoy all the illustrations. It's a beautiful package. Mac Barnett is having a very good 2014! He has three picture book releases this year, all of which are delightful! Be sure to check them out! About the Book: Sam and Dave are digging a hole and they won't give up until they find something spectacular. 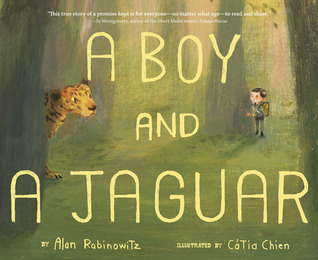 GreenBeanTeenQueen Says: Mac Barnett teams up with Jon Klassen for another winner. Klassen's illustrations match the text perfectly and gives the feel of an outdoor adventure. Readers will spot the spectacular treasure that is hiding just out of Sam and Dave's reach and are sure to laugh when the get so close but then change directions. They'll also be sure to notice the dog is the only one who seems to have a nose for treasure hunting. A fun tale that is sure to inspire some digging of your own. 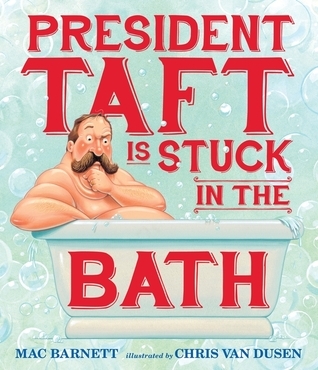 About the Book: President Taft is stuck in the bath! How will he get out? GreenBeanTeenQueen Says: Mac Barnett takes on a presidential tall tale with humorous results. The president is stuck in the bath and everyone has an idea of how to help. The ideas get more and more ridiculous, from butter to explosions. There are also plenty of textual humor from the secretary of the treasury who responds with "throw money at the problem" to "the answer is inside you" from the secretary of the interior. 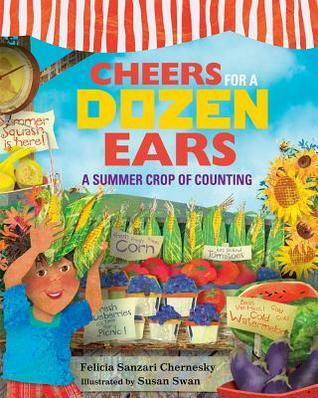 Chris Van Dusen's illustrations are cartoonish and add to the humor of the tale. The end of the book provides some historical facts about President Taft and his bathtub. This would pair with King Bidgood's in the Bathtub for a silly bathtime storytime. 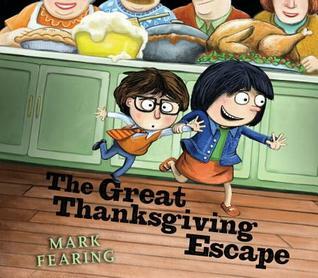 About the Book: It's time for Peter to fly home, but his message about dinner gets scrambled along the telephone line. GreenBeanTeenQueen: Remember the game telephone? Where what you start out saying ends up completely different? 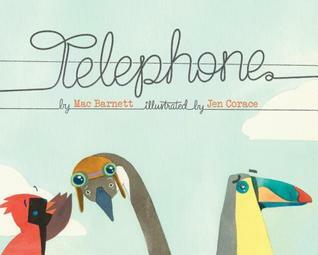 Mac Barnett and Jen Corace re-imagine the telephone game with a flock of birds on a telephone wire with hilarious results. Each new message gets more and more mixed up which is sure to leave young readers howling with delight. Each bird hears something new that makes sense to them and matches their own interests and hobbies. The illustrations reflect the each birds interests and helps the reader find clues as to why each bird heard what they did. A hilarious take on a the game of telephone perfect for reading aloud. Full Disclosure: Sam and Dave Dig a Hole and President Taft is Stuck in the Bath reviewed from finished copies sent by the publishers. Telephone reviewed from library copy. About the Book: Elephant wakes up feeling grumpy. Until a delivery arrives at his door and a new hat cheers him up. Elephant wants to share his hat and along the way cheers up his friends. GreenBeanTeenQueen Says: I'm a sucker for retro-style illustrations. There's just something about them that make me feel happy. Hooray for Hat! features what could be called some retro-style illustrations and it fits the book perfectly. Elephant is grumpy but his hat cheers him up. He visits his friends throughout the day and cheering them up with a hat of their own. The text is simple and the illustrations are bright and simple and not distracting making this a great storytime book. There's also a nice repetitive refrain of "Hooray for Hat" that kids can cheer along as the animals become happy. This is a great story of how a simple act of kindness can make someone's day. This would be a great book to talk to kids about being kind, helping others, and paying it forward. I've used this one in storytime a few times this year and each time I've read it it's been a bit hit. 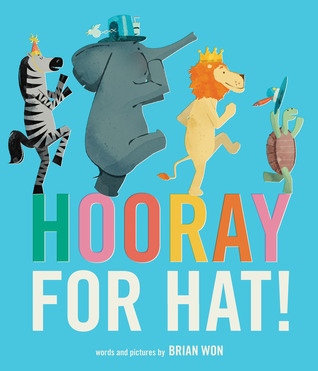 The kids catch on quickly to saying "hooray for hat" excitedly with each animal. And the joy the animals experience in sharing their gifts expands to the kids. The illustrations catch the expressions of the animals perfectly and the kids can see that and they get just as happy as each animal gets a new hat. 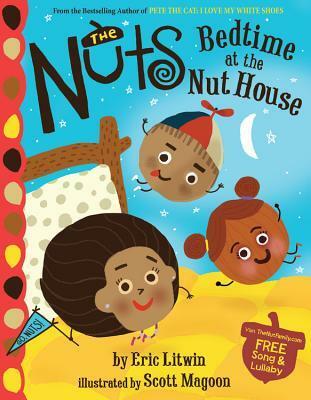 A fun picture book debut that is a great storytime addition. About the Book: A snake finds himself in the wrong pit. 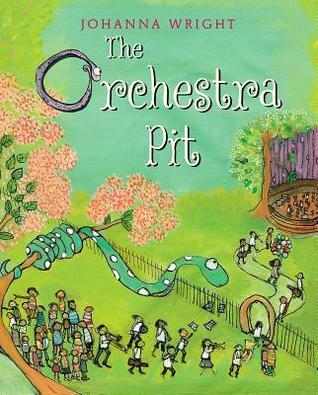 Instead of a snake pit, he winds up in an orchestra pit and learns about the various instruments that make up an orchestra. GreenBeanTeenQueen Says: I have a music teacher mother so I was raised on music and books about music. I love finding books that I can use in storytime to introduce instruments and music to kids. Sometimes books that talk about the orchestra are a bit too long or detailed to use with a young audience. Johanna Wright fills that void with The Orchestra Pit. As our snake finds his way through the orchestra pit, he discovers the various instruments and sections of the orchestra. He even discovers what the instruments sound like comparing the percussion to a gorilla and the horns to a elephant. Younger readers might need a bit of help understanding that where an orchestra plays is called an orchestra pit and that each instrument has a unique sound. But The Orchestra Pit is the perfect starting point for that introduction. Read this one before you visit the symphony (or have the symphony visit the library for an instrument petting zoo and concert!) for an extra special treat. 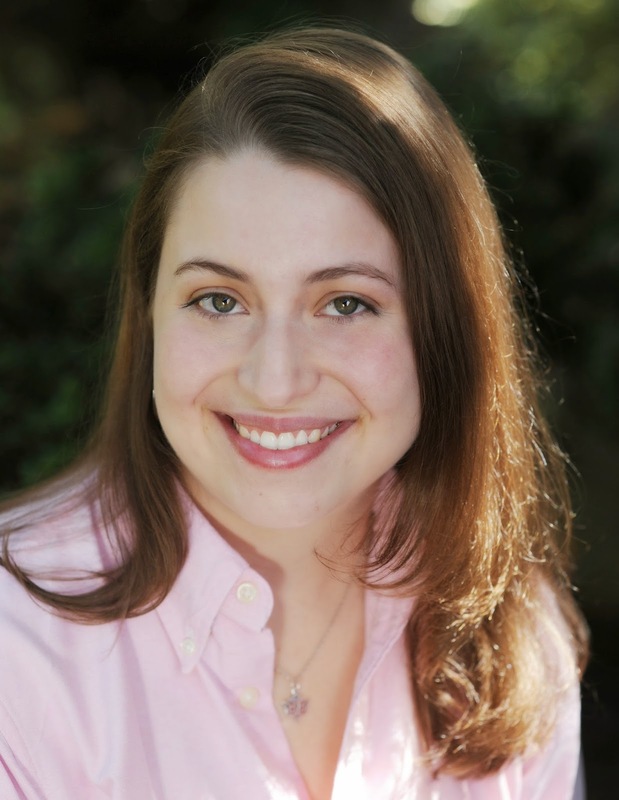 I'm excited to welcome middle grade author Shelby Bach to GreenBeanTeenQueen! If the middle grade readers at my library are anything like yours, fairy tales are huge! About Shelby: Shelby Bach was born in Houston, Texas and raised in Charlotte, North Carolina, but while writing the ever afters, she moved almost as many times as her main character. 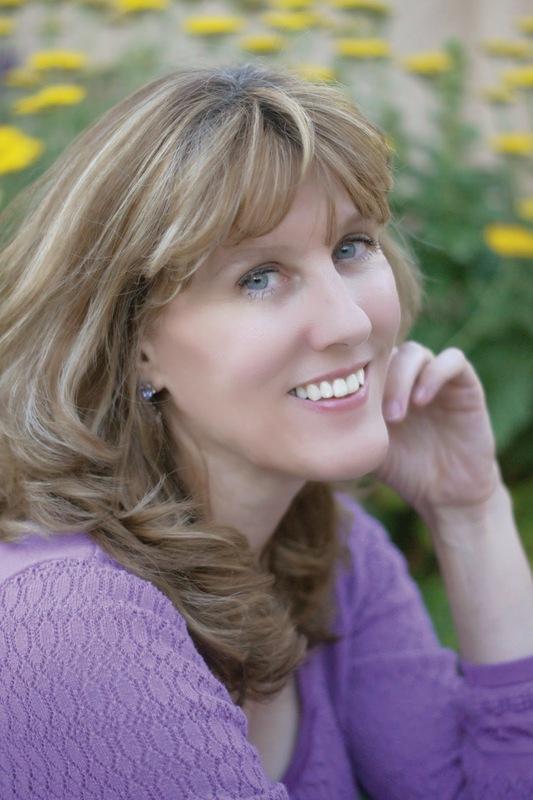 She came up with the idea for the series right before she left New York City, and she finished the first book, of giants and ice, in Montana—the second, of witches and wind, back in Charlotte. Driving up the West Coast to research the settings for the third book, of sorcery and snow, Shelby fell in love with Portland, Oregon and settled there. She would love to set up a Door Trek system in her apartment to visit her family and friends around the country, but she makes due with much slower and less fictional transportation. These days, while finishing up the fourth and final book, she also works part time for a real-life afterschool program. It is strangely similar to the one where her stories are set—except the students study math instead of fairy tales. I love adding new characters, and I especially love giving a side character a strong subplot of their own. Of course, this enthusiasm led to several unruly early drafts of my first novel, Of Giants and Ice, and as an inexperienced novelist, I spent weeks overwhelmed by the number of plot threads I was failing to keep straight and develop effectively. Somewhere around draft number five, I started to use the Rule of Threes to help me structure each of the story arcs. It was a good decision—both for my book and for my sanity. The Rule of Threes is usually explained as a pattern that occurs three times, which happens a lot in fairy tales. In some, these repetitions occur in just one section: for instance, at the end of “Cinderella,” three people try on the glass slipper the prince is carrying: the two stepsisters and Cinderella. Sometimes, these repetitions make up most of the fairy tale: for example, Jack climbs the Beanstalk three times. I took a fairy tale course in college that analyzed the Rule of Threes in more detail. (Believe it or not, this was one of the hardest classes I ever took at Vassar. Professor Darlington was a stickler for structure and precision in every paper. My grades suffered, but my writing improved.) First of all, plain repetition gets pretty boring, so our class examined what the three instances actually achieved within the fairy tale: the first one describes the process of actually climbing a beanstalk and sneaking around a giant’s house. The second instance establishes what part of that process is a pattern: Jack climbs the beanstalk again but steals a golden goose from the giant instead those gold coins. (It’s usually the shortest passage.) The third instance, however, breaks with what was established with the first two occurrences and leads to some sort of big change: the giant notices Jack stealing his harp and chases him down the beanstalk. Describing just one trip up the beanstalk would have made a fun story, because the first two instances establishes certain expectations, Jack’s third trip has a bigger impact. 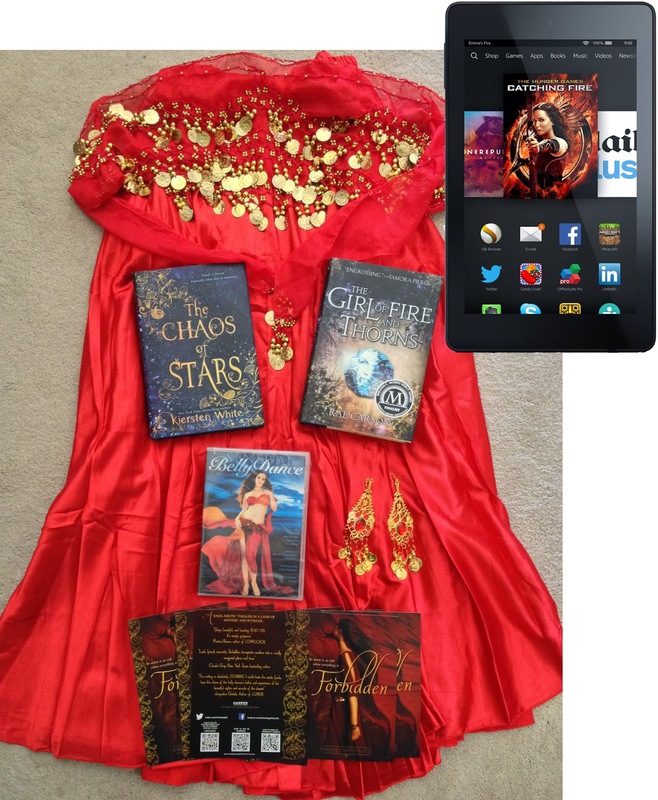 Limiting myself to three occurrences helped me tame the plot threads in Of Giants and Ice. It also forced me to make sure every scene in a certain arc served a purpose. An almost spoiler-free example is the subplot around Rory’s dad. 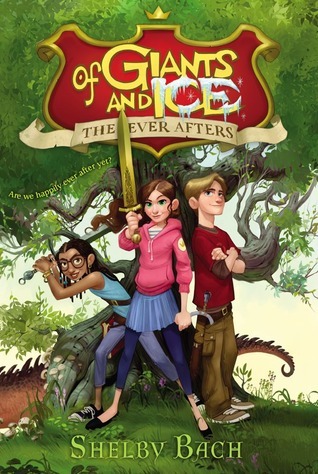 Her parents are divorced, so readers don’t actually see her father in person in Of Giants and Ice. Rory does, however, speak to him on the phone—exactly three times. During the initial call, Rory’s father, a Hollywood director, invites her to a shoot in England during the summer. Rory knows immediately that she doesn’t want to go (he barely pays any attention to her while he’s filming a movie), but afraid of disappointing him, Rory tells him she’ll think about it. Her father doesn’t listen well—he starts telling her all about the actress he wants her to meet when they’re in England. This leads to her mother stepping in and Rory’s parents fighting. The second call takes place a few weeks later. Rory tries to talk to her father about something completely different, but he asks her when her school lets out—he wants to book her flight. She reminds him that she hasn’t made up her mind up and quickly ends the call before her mom can step in again. That’s a tiny step forward—she avoids a fight between her parents, but she still isn’t honest. The third call takes place after Rory has come back from her quest. She discovers from the tabloids that her father has started dating the actress he wanted her to meet in England, and Rory calls him up and tells him that she won’t go on the trip with him. Then she explains exactly how much it upsets her that she had to find out about his new girlfriend from an outside source. Because readers have seen Rory struggle to be honest about her feelings in the previous scenes, her strong stance in the final call has more oomph. This isn’t much different from most goals in fiction—to show how conflict has changed our characters—but the Rule of Threes was a helpful way to think about it, especially when working with an overwhelming amount of plot threads. As I mentioned earlier, the Rule of Threes was most helpful during the revision process—conscious repetition is easier to develop when you have a whole plot to work with. It’s also easier to recognize where plot threads intersect. In my second novel, Of Witches and Wind, I challenged myself to take several story arcs and see how many third instances I could pack into one scene. It tightened the book’s pacing and gave the ending a way more epic grand finale. Welcome to Tune In Tuesday! What is Tune In Tuesday? It's a monthly round up about music-favorite songs, favorite albums, and favorite ways to use it in the library! If you have a Tune In Tuesday post this month, be sure to share it in the comments so I can add it to the round up-and let me know if you want to host next month. I recently discovered The Pop Ups-a fantastic kids music duo from New York and I've become the biggest fan. I've been telling everyone I know about them and trying to get everyone to listen to their music. This is fantastically fun music that kids and parents will love! The Pop Ups have three albums out, with Appetite for Construction as the latest just released this year. I love all three and they are great for background music for programs at the library or play time at home. But I've also used several of their songs for programs. Check out a preview for Appetite for Construction. Robot Dance: I've used this one in my dance party and as part of my geeky storytime. What's more geeky than robots? It's a lot of fun and a great imaginative and pretending song. Block House: A song about blocks? It's the perfect opening song to kick off my block parties. Airband (from Outside Voices): I used this one in storytime and we jumped around like rock stars-tons of fun! Be sure to check out The Pop Ups-I'm sure you'll become addicted to their music like I have!